To get married in British Columbia, the Marriage Act requires that the couple get a Marriage Licence. You may get married during the three-month term of the licence. Only one member of the couple needs to apply in person for a marriage licence. Find here locations of Marriage Licence Issuers. The current fee for a Marriage Licence is $100.00 and must be paid at the time of application. 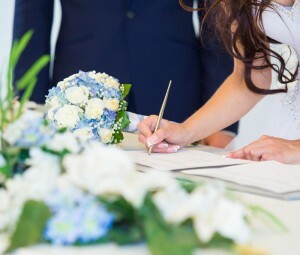 To ensure accuracy of marriage certificates issued after registration and to verify legal age to apply for a marriage licence, primary identification in the form of a birth certificate, IMM/Immigration form, Permanent Resident or Citizenship card confirming 1) full legal names 2) birth date 3) place of birth should be provided for both parties. You will also be asked to provide information on your current marital status and address. The marriage licence is issued at the time of application. The marriage licence is non-refundable, valid for three months and may not be extended. by mail by completing and submitting an order form with the fee toVital Statistics (download a form here).